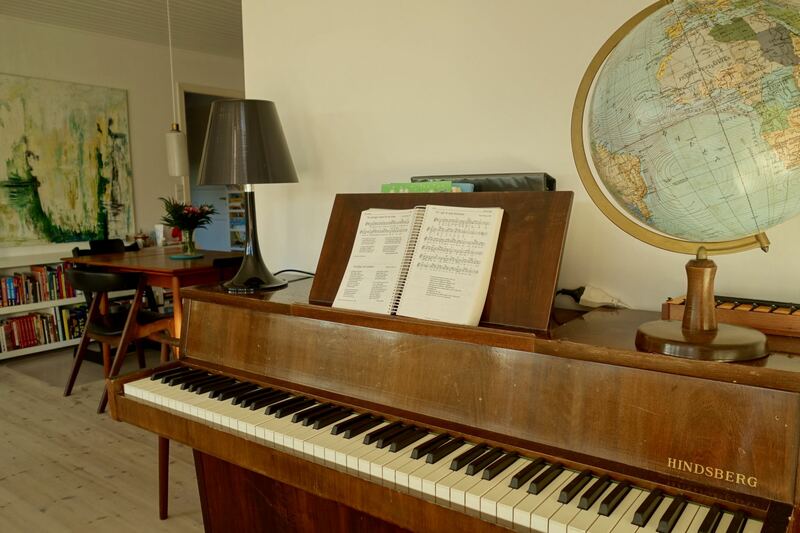 Our first experience of renting in Copenhagen has been nothing but positive, thanks to the owners of the house we’re staying in and its design. They have gone travelling around Bali for two months and have kindly left everything for us to use. Rather than ramble on about how nice it looks, I thought I’d ask our landlords about the inspiration behind their beautiful home. Not only are they lovely people who agreed to help me with this post, they are also architects, so they know what they’re talking about. Which Danish designers inspire you? We are not inspired by any particular Danish designers, but more by a general Nordic architectural tradition based on concepts as light, minimalism and functionalism. We moved some walls and made a new kitchen in order to create one main living space with large windows towards south. We find the daylight important, especially during winter, when it is very sparse. When the house is rather small, it is important to have one large open space, it makes the house seem bigger. 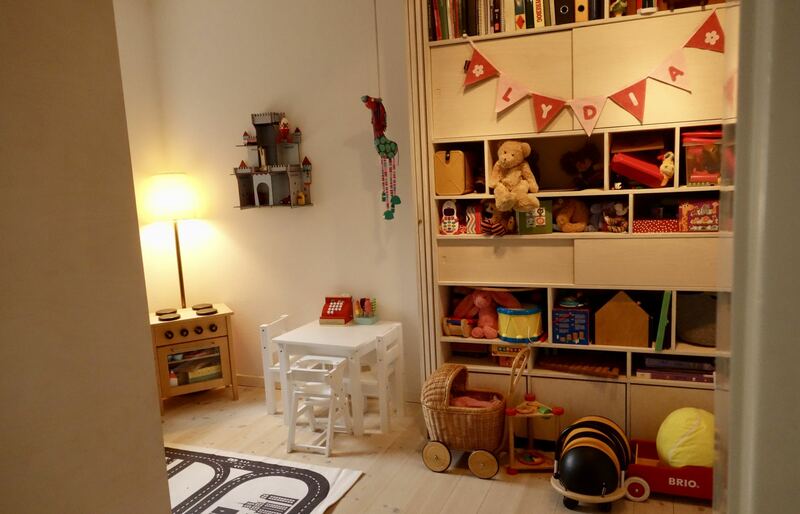 Is does not matter to us if the secondary rooms are small as long as we have one large airy living space. 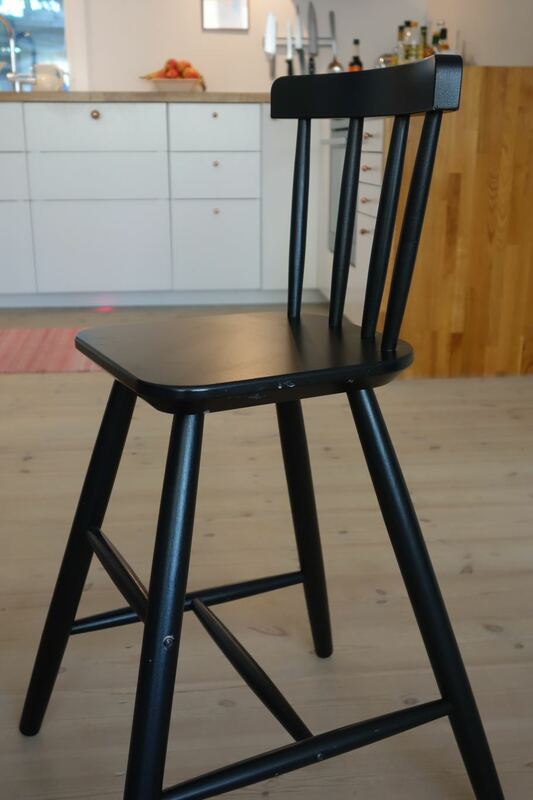 Have you got any typical Danish pieces in the house? 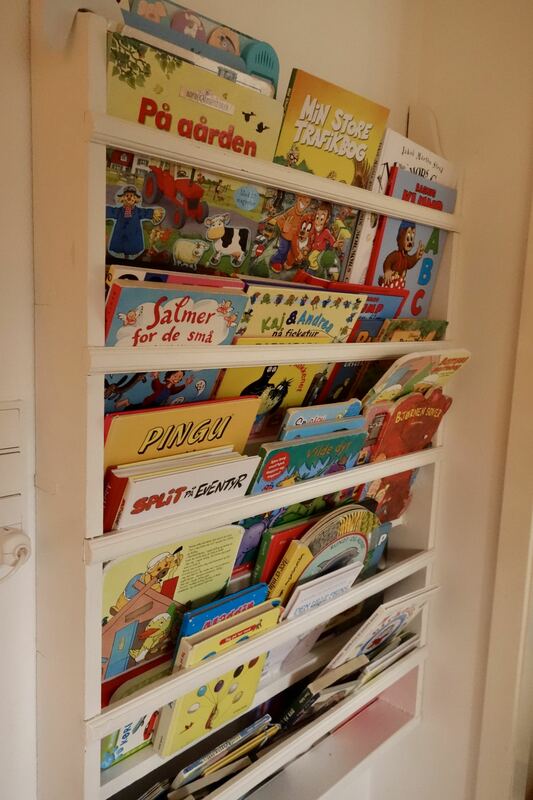 We do not own any real Danish classics. 🙂 It is a mixture of old, new, second hand, inherited and self made. As long as it has a certain quality to it, we do not care who made it. 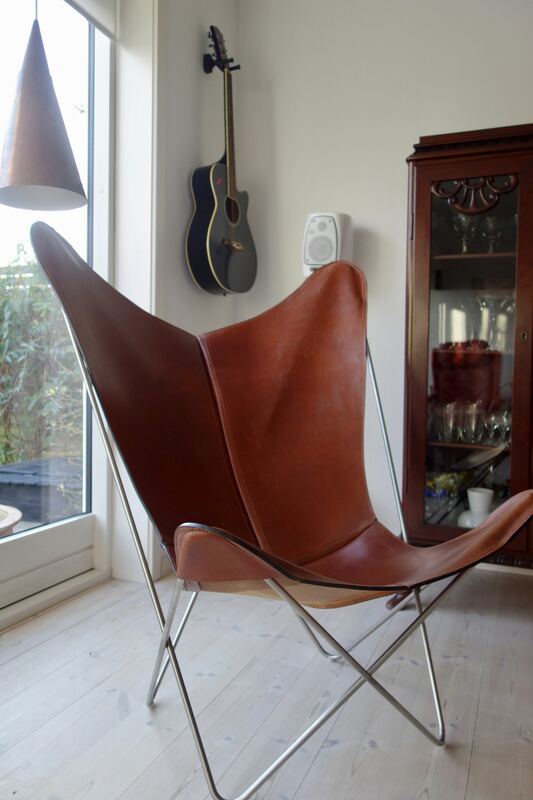 The leather chair is an Argentinian classic called The Bat Chair. Our version is a Danish reinterpretation by OX Denmarq. 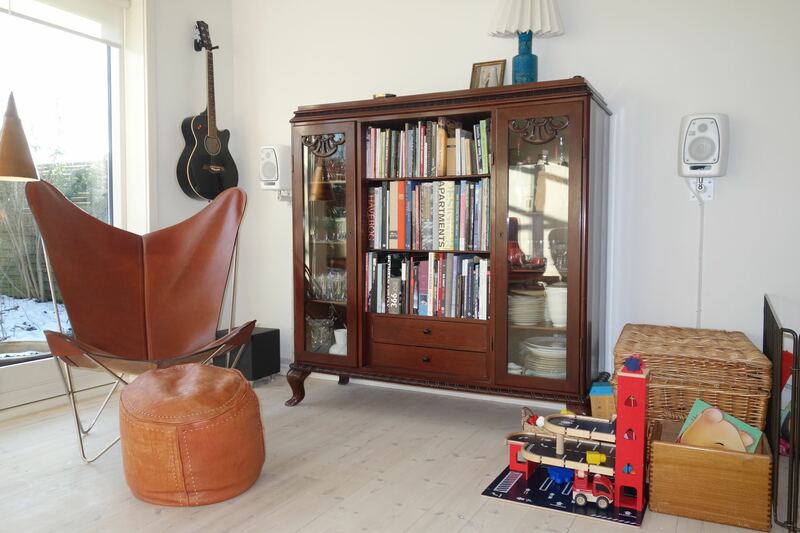 What three words would you use, to sum up Danish interior style? 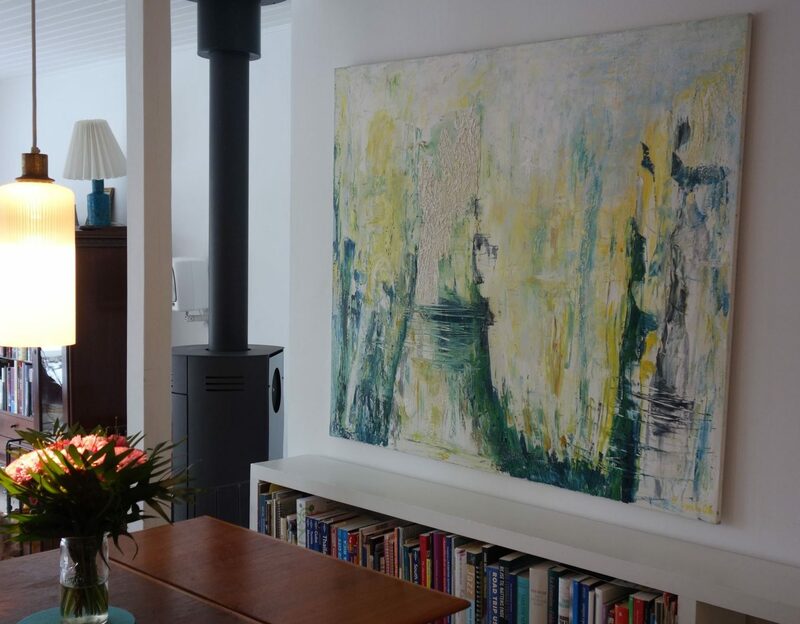 Modernism, second hand and furniture classics. We create intimate spaces within larger spaces with lighting and furnishing. The large windows and the sunlight coming through it. There are quite a few small lamps rather than one main light in the house. Is this a deliberate choice and is it part of a hygge lifestyle? It is very deliberate. 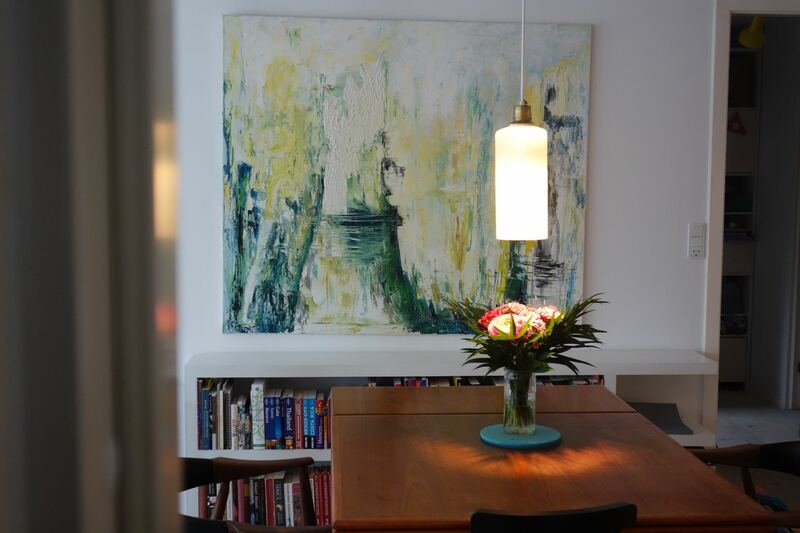 We use lamps for furnishing in order to create smaller spaces within a larger room. It makes the room seem bigger and more “hyggeligt”. Did you create the desk space in the hallway? 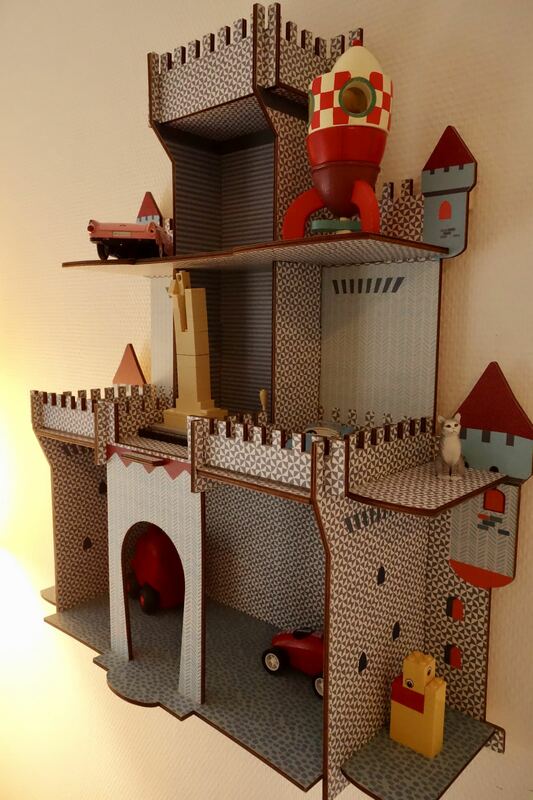 Yes, I designed it and built it from bare sheets of birch and mdf. We wanted a small office space and it is the only place, you can close the door. 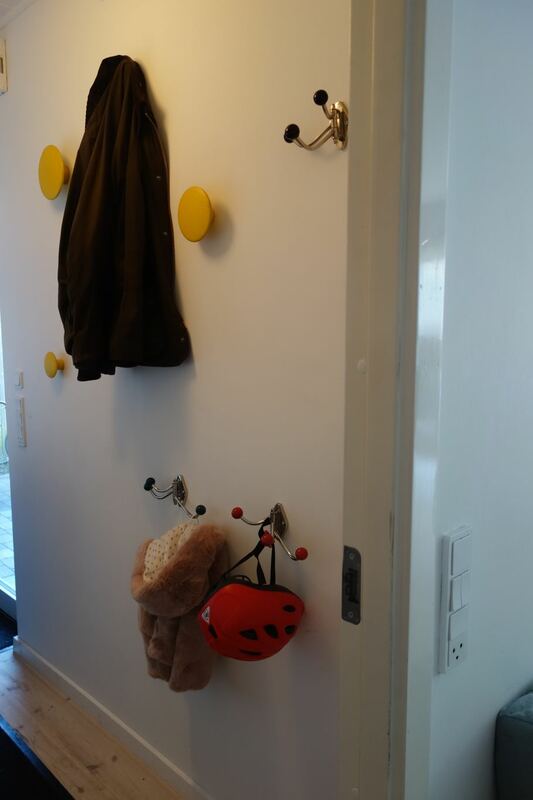 The same with the sliding doors and cabinet in the children’s room. 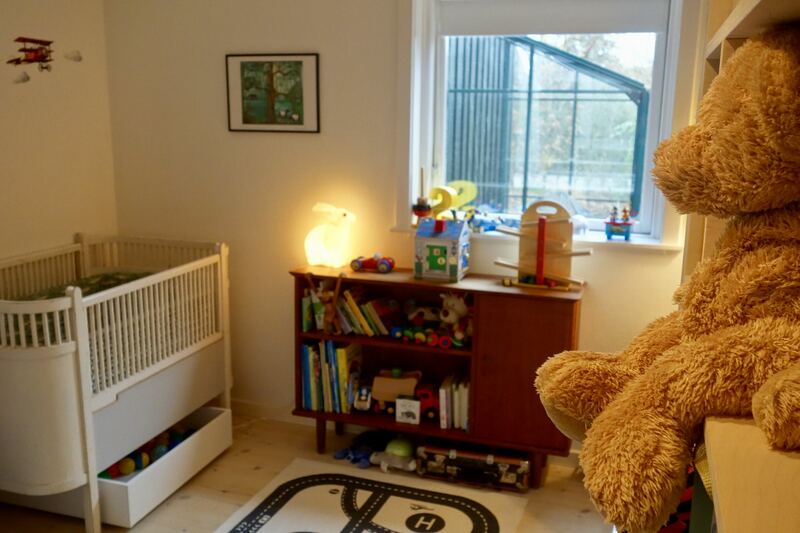 It is made from sheets of birch, and the idea was to keep the room close to the living space, so the children feel comfortable, and don’t take all the toys into the living room. However, it is still possible to close it, when they have to sleep. I made the kitchen as well, where the kitchen table is made from pieces of oak that goes all the way to the floor in one movement. 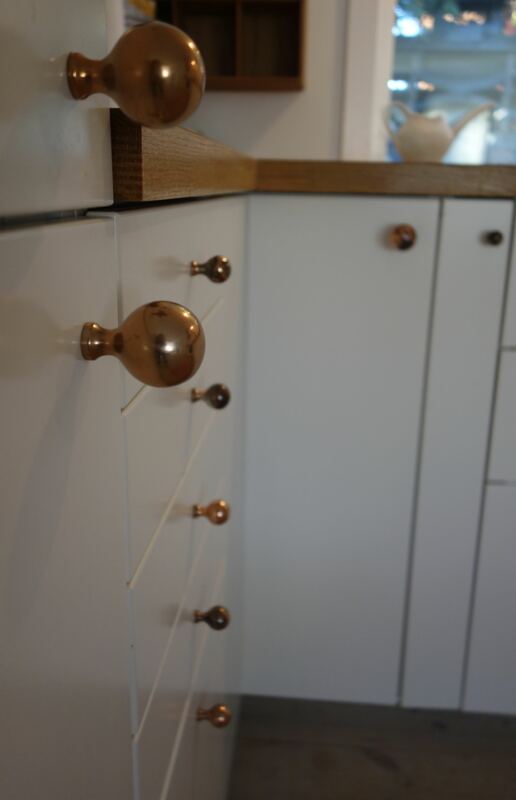 It is these details that have made living here so enjoyable. I love this art work, painted by the owner’s mother. The artistic eye runs in the family! Thank you for having us to stay. 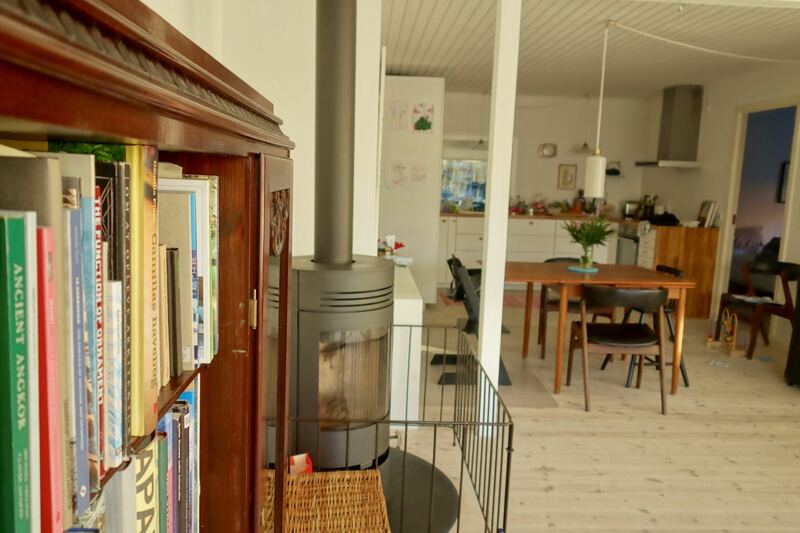 It’s been the perfect launch pad into Danish living. We will be sad to leave at the end of the month!